Last year's extended edition Blu-ray of the first Hobbit film won our Blu-Ray Of The Year Award so there is no reason not to think that the second film's extended edition will be just as spectacular a release as the first. 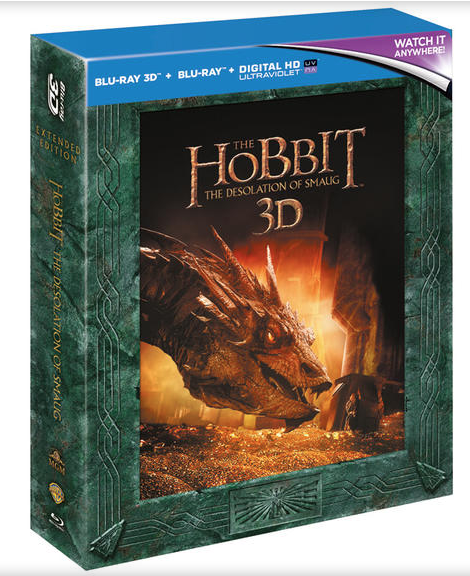 The Hobbit: The Desolation Of Smaug will arrive November 3, 2014 on Extended 5-disc 3D Blu-Ray, and a 3-ddisc standard Blu-Ray release. It will include 25 minutes of footage put back into the film to give it a running time of 186 minutes. you can see the cover art for the 3D version and watch a deleted scene that will be added to the film below.